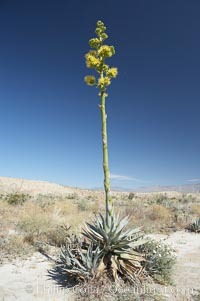 Desert agave, also known as the Century Plant, blooms in spring in Anza-Borrego Desert State Park. 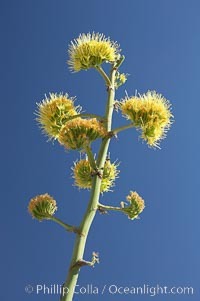 Desert agave is the only agave species to be found on the rocky slopes and flats bordering the Coachella Valley. It occurs over a wide range of elevations from 500 to over 4,000. It is called century plant in reference to the amount of time it takes it to bloom. This can be anywhere from 5 to 20 years. 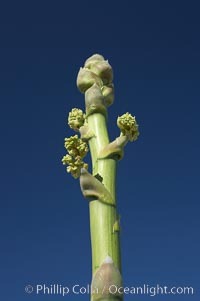 They send up towering flower stalks that can approach 15 feet in height. Sending up this tremendous display attracts a variety of pollinators including bats, hummingbirds, bees, moths and other insects and nectar-eating birds. Century Plant Photo. 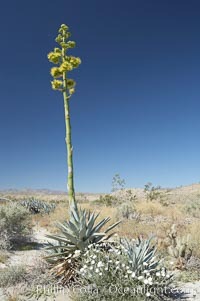 Desert agave, also known as the Century Plant, blooms in spring in Anza-Borrego Desert State Park. 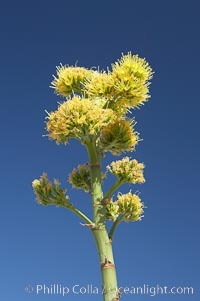 Desert agave is the only agave species to be found on the rocky slopes and flats bordering the Coachella Valley. It occurs over a wide range of elevations from 500 to over 4,000. 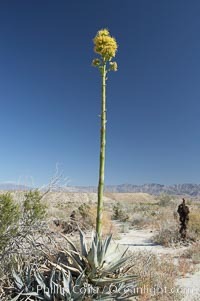 It is called century plant in reference to the amount of time it takes it to bloom. This can be anywhere from 5 to 20 years. 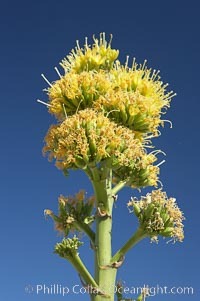 They send up towering flower stalks that can approach 15 feet in height. Sending up this tremendous display attracts a variety of pollinators including bats, hummingbirds, bees, moths and other insects and nectar-eating birds. Century Plant Picture. 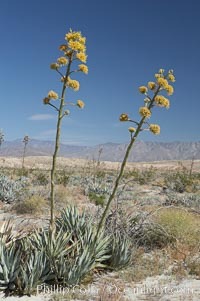 Desert agave, also known as the Century Plant, blooms in spring in Anza-Borrego Desert State Park. 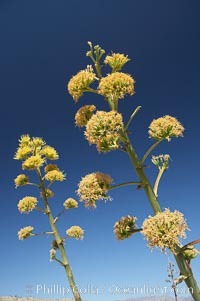 Desert agave is the only agave species to be found on the rocky slopes and flats bordering the Coachella Valley. It occurs over a wide range of elevations from 500 to over 4,000. 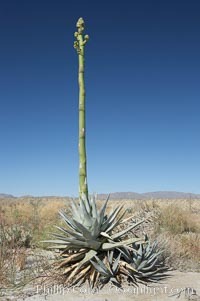 It is called century plant in reference to the amount of time it takes it to bloom. This can be anywhere from 5 to 20 years. 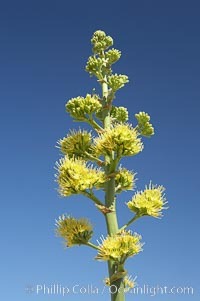 They send up towering flower stalks that can approach 15 feet in height. Sending up this tremendous display attracts a variety of pollinators including bats, hummingbirds, bees, moths and other insects and nectar-eating birds. Stock Photography of Century Plant. 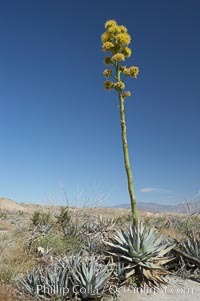 Desert agave, also known as the Century Plant, blooms in spring in Anza-Borrego Desert State Park. 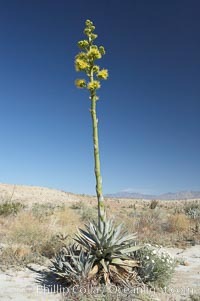 Desert agave is the only agave species to be found on the rocky slopes and flats bordering the Coachella Valley. It occurs over a wide range of elevations from 500 to over 4,000. 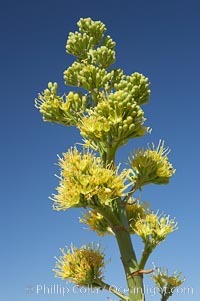 It is called century plant in reference to the amount of time it takes it to bloom. This can be anywhere from 5 to 20 years. 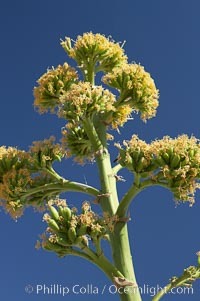 They send up towering flower stalks that can approach 15 feet in height. Sending up this tremendous display attracts a variety of pollinators including bats, hummingbirds, bees, moths and other insects and nectar-eating birds. 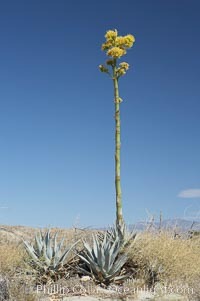 Photograph of Century Plant. 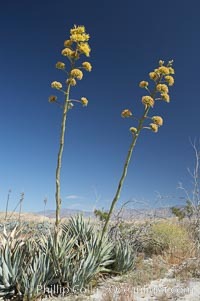 Desert agave, also known as the Century Plant, blooms in spring in Anza-Borrego Desert State Park. 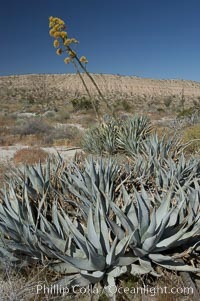 Desert agave is the only agave species to be found on the rocky slopes and flats bordering the Coachella Valley. It occurs over a wide range of elevations from 500 to over 4,000. It is called century plant in reference to the amount of time it takes it to bloom. This can be anywhere from 5 to 20 years. 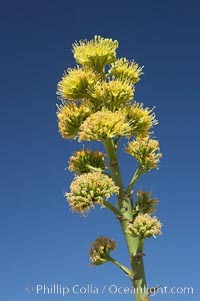 They send up towering flower stalks that can approach 15 feet in height. Sending up this tremendous display attracts a variety of pollinators including bats, hummingbirds, bees, moths and other insects and nectar-eating birds. Century Plant Photos. 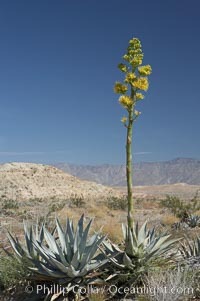 Desert agave, also known as the Century Plant, blooms in spring in Anza-Borrego Desert State Park. 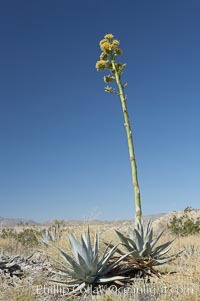 Desert agave is the only agave species to be found on the rocky slopes and flats bordering the Coachella Valley. It occurs over a wide range of elevations from 500 to over 4,000. It is called century plant in reference to the amount of time it takes it to bloom. This can be anywhere from 5 to 20 years. 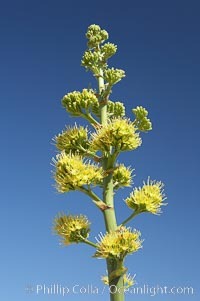 They send up towering flower stalks that can approach 15 feet in height. Sending up this tremendous display attracts a variety of pollinators including bats, hummingbirds, bees, moths and other insects and nectar-eating birds. 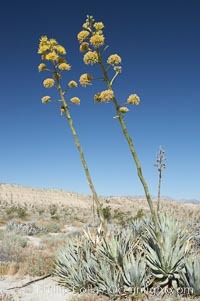 Century Plant Image. 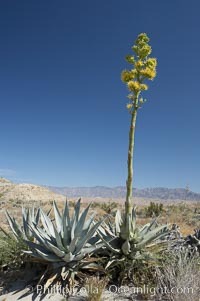 Desert agave, also known as the Century Plant, blooms in spring in Anza-Borrego Desert State Park. 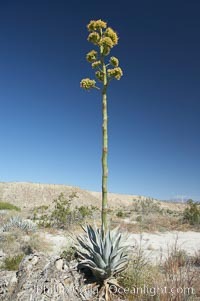 Desert agave is the only agave species to be found on the rocky slopes and flats bordering the Coachella Valley. It occurs over a wide range of elevations from 500 to over 4,000. 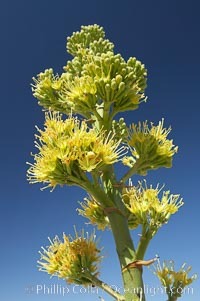 It is called century plant in reference to the amount of time it takes it to bloom. This can be anywhere from 5 to 20 years. 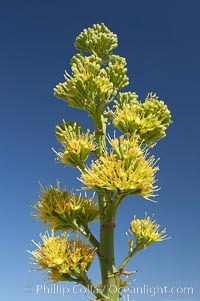 They send up towering flower stalks that can approach 15 feet in height. Sending up this tremendous display attracts a variety of pollinators including bats, hummingbirds, bees, moths and other insects and nectar-eating birds. Professional stock photos of Century Plant. 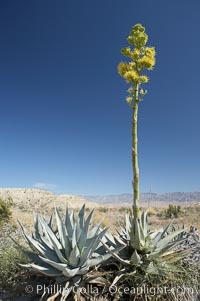 Desert agave, also known as the Century Plant, blooms in spring in Anza-Borrego Desert State Park. 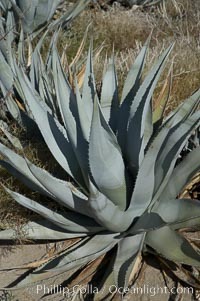 Desert agave is the only agave species to be found on the rocky slopes and flats bordering the Coachella Valley. It occurs over a wide range of elevations from 500 to over 4,000. It is called century plant in reference to the amount of time it takes it to bloom. This can be anywhere from 5 to 20 years. 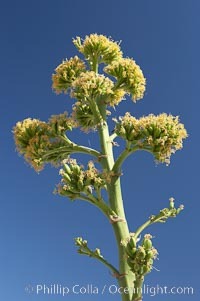 They send up towering flower stalks that can approach 15 feet in height. Sending up this tremendous display attracts a variety of pollinators including bats, hummingbirds, bees, moths and other insects and nectar-eating birds. Pictures of Century Plant.